Starting to trade without knowing the offerings of a broker is risky and could increase your woes. Therefore, we sought to find out the key features of Opteck, which can assist you make a sound decision, in case you prefer it for trading. Opteck’s website, launched in 2011, is aptly designed to cater for the interests of binary options traders. The site is intuitive and full of resources to assist traders have an enjoyable and rewarding trading experience. Opteck has an innovative trading platform that has been built to cater for the needs of both beginner and advanced traders. 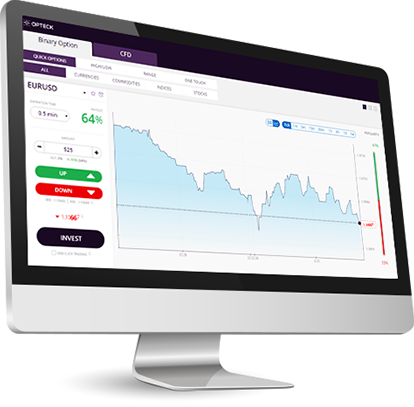 The platform has more than 70 financial assists for trading, which consists of stocks, currencies, indices, and commodities. Opteck also offers a demo account, which you can use to test-run the platform beforehand. Importantly, the platform can be accessed anywhere, anytime, and from any device—through a web browser, downloadable on a PC, or installing on a mobile gadget. At Opteck, there are different account types, which gives you the opportunity to go for the one that resonates well with your abilities and appetite. The account types are Green ($250-$499), Bronze ($500-$999), Silver ($1,000-$4,999), Gold ($5,000-$9,999), Platinum ($10,000-$24,999), and Black ($25,000-$50,000). Since Opteck places high emphasis on the safety of clients’ funds, all payments are delivered using the most secure encryption technology. The broker provides a wide range of payment methods, and requires a minimum deposit of $250 for new accounts. As much as Opteck boasts of more than 40,000 traders from more than 80 countries around the world, the broker does not allow U.S. traders to use its services. At Opteck, payouts can be as high as 85%. The broker also offers rebates of 15% only on some few trading items. Furthermore, other binary options, such as One-Touch Options, can earn profits of as much as 100%. Opteck approves and processes withdrawal requests within three to five working days. The withdrawal will be sent via the same means you used for making your initial deposit. Opteck offers a high deposit bonus range of 50% to 100%. Furthermore, the broker frequently holds different promotions to keep traders motivated. The broker’s support department can be reached 24/7 via online chat, email, or phone (call back). Opteck is a credible broker that operates under strict regulatory conditions. Opteck is the brand name of a company called Centralspot Trading Limited, which has its main offices in Limassol, Cyprus. The company is regulated by the Cyprus Securities and Exchange Commission (CySEC) under license number 238/14. Therefore, Opteck is not a scam broker, and you are sure of transparent trading conditions, if you choose it to take care of your brokerage needs. The main types of binary options available at Opteck are On Demand Options, Range Options, One-Touch Options, and High/Low Options. The options have flexible expiration times, which range from one minute to two minutes, daily, and to even longer time frames. 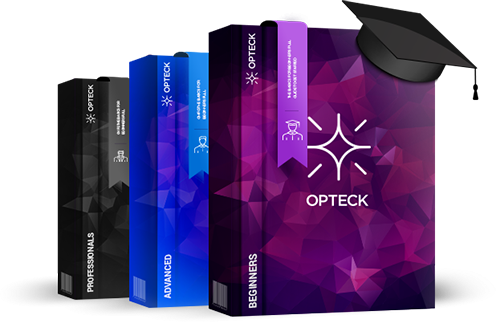 Opteck has an Academy where an extensive range of materials and resources are available to assist traders refine their binary options trading expertise. Some of the materials available at the Academy include eBooks, tutorials, trading strategies and concepts, and articles. Opteck esteems that traders come from different backgrounds. As such, it offers support in several languages, including English, Arabic, French, Italian, Spanish, Polish, Turkish, German, and Dutch, Russian. Opteck is driven by the goal of advancing the trading capabilities of its customers using education and technology. Therefore, if you want to become a better trader, opening an account with the broker can help you realize your dreams faster.